High End 2018 Report. Head-Spinning Sounds in Munich! 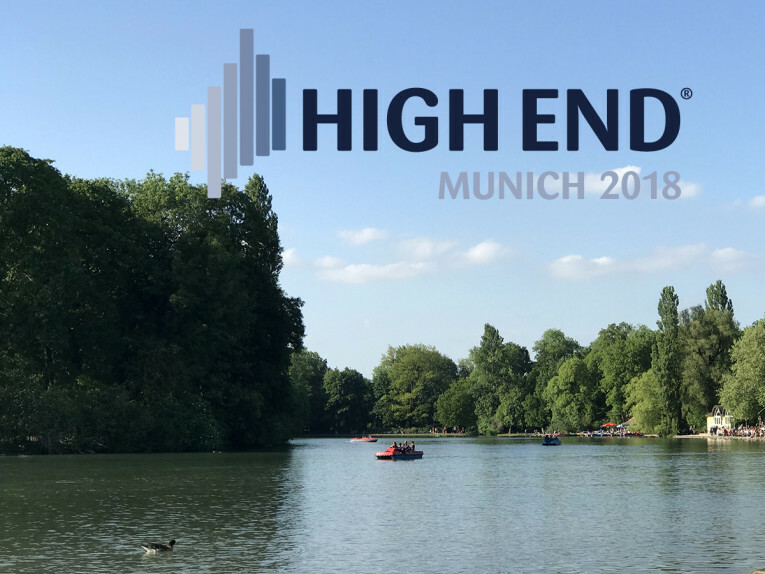 The 2018 High End show promised to be the best one ever, in part because of the most pleasant weather conditions experienced in Munich - almost summer like - turning the Bavarian region into a tourist postcard and making any outing a true pleasure and the entire experience of beer and German food even more enjoyable, particularly in the fantastic nearby Englischer Garten esplanades and restaurants. 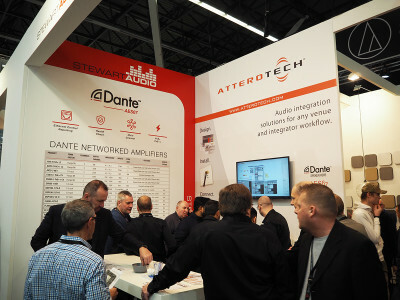 High End show is one of the best organized shows in the world, and certainly the best in the audio industry. It's also one of the most successful shows given the expansion in the last few years and the fact that it has clearly far surpassed the promotor's - the High End Society - ambitions in terms of its own scope and (formally) regional market. 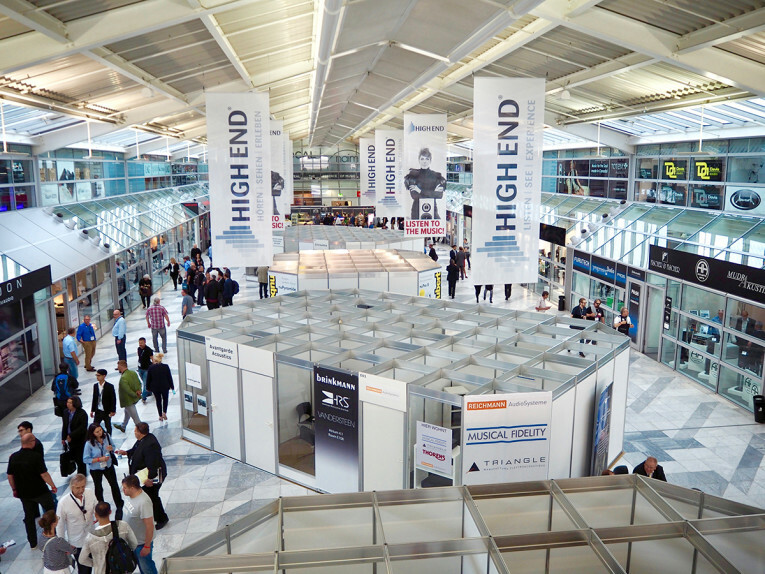 These days, for the brands attending the Munich show, it's mostly about the results they can achieve in the first day - distributors and trade (and also press) day. Results in the remaining three days, when it is open to public, can largely vary, basically because Germany is one of the most unpredictable countries for these things when they depend on local visitors. One way or another, there seems to always be a religious or national holiday, a big football game involving the local Bayern FC, or something else, and suddenly exhibitors are surprised with a show where there's hardly anyone, apart from other exhibitors and the press. Not a bad thing for the press... but it is very hard to understand how the show on a Friday can be bursting with activity, making it hard to access any of the demo rooms or walk the aisles, and the next two days - a Saturday and a Sunday - and it seems like no even knows there's a show in town. This year it was Mother’s Day on Sunday, a day where Germans "show their appreciation toward mothers and mother figures" - held at different dates in the calendar - and which we have learned, means that Germans in general consider a sacred time to be away for a day... or in this case the full weekend. Just days before, it was Father’s Day ('Vatertag'), which in Germany, is celebrated on Ascension Day, which is a public holiday in Germany. Fortunately that was on Thursday, when the show was trade only, otherwise there would have been no one there. I've asked my German friends and was told that the custom on Father's Day is that men will go out, drink a lot, and party. Munich at night was certainly lively, also with students, who enjoy an extended break. So, that might explain also why two days later they devote themselves to the "mothers." The vinyl renaissance is in full swing. 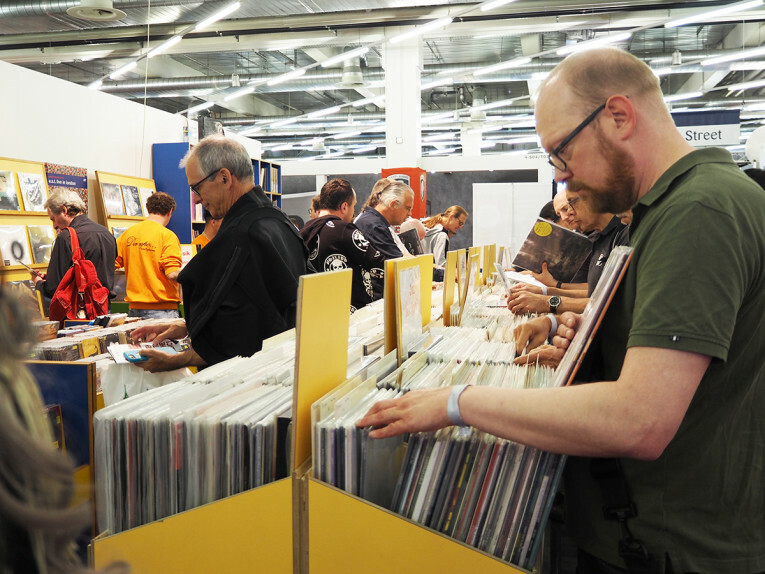 The format itself is appealing, but at the 2018 High End show in Munich, things started to get a little out of control with the high-end companies bringing back esoteric turntables - and everything that goes with it. 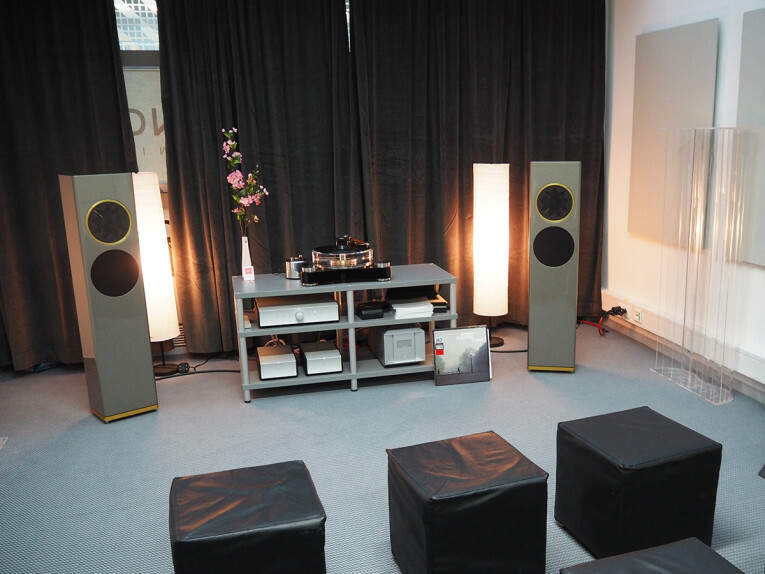 The excellent MOC exhibition space has also reached its limit and is forcing many companies - particularly manufacturers - to book suites in nearby hotels, not to mention the "traditional" separate Hifideluxe exhibits for esoteric audio companies that would never consider mixing with the High End crowds. 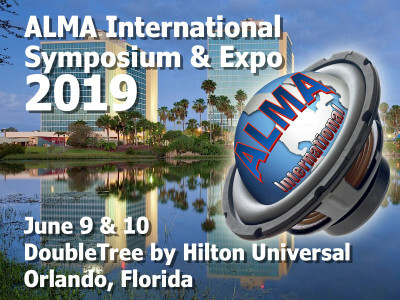 Many others simply join Hifideluxe because it's the only space in town where they can find a suitable demo space (plus there's even a free shuttle to connect the MOC with the Marriott where these exhibits take place...). For the headphone enthusiasts, this year there was the CanJam Europe (no relation with Headfi's CanJam Global shows), just across the street in a very nice building. But headphones don't actually need much space, and most of the major brands were already (very nicely) accommodated in proper booths at the High End, where there was also the traditional Kopfhörerbar (headphone bar), which is the reason why the whole concurrent CanJam Europe idea wasn't exactly a success - except for a few brands that booked the event last minute and tried to compensate visitors with nice sofas, plenty of gear to try, and nice beer (thank you Sonoma). And with the air heavy with analog heat (maybe it was the Munich heatwave, but the tubes help...), the trend was also to show off heavily modified reel-to-reel (R2R) machines and vintage speakers. Nagra even had a complete museum this year (and it was truly amazing...) and there were special listening sessions of never before released reels with bootleg recordings. Honestly, I did enjoy seeing the new Balfinger (www.ballfinger.de) machines displayed in the Recording The Masters (www.recordingthemasters.com) booth - at least that's something totally new and exciting! And I actually had a very pleasing listening experience at the Tim De Paravicini/EAR Yoshino room, where Lin Stanley was singing live over its latest studio recording on 30 ips tape. I don't know if it was the tape sound on Tim's own Denon reel machine playing, or the Graham Audio (www.grahamaudio.co.uk) BBC LS5/8 monitors (Lin's voice was amplified on a separate pair of LS3/5 monitors), but the sound clearly made my brain travel 25 years back to the studio. A true "analog flashback" and an excellent one. Unfortunately, the comparison with the same track playing on a one-step vinyl pressing took me back to the crude reality of something I really don't want to go back to. It truly was R2R -10 to Vinyl - 0! 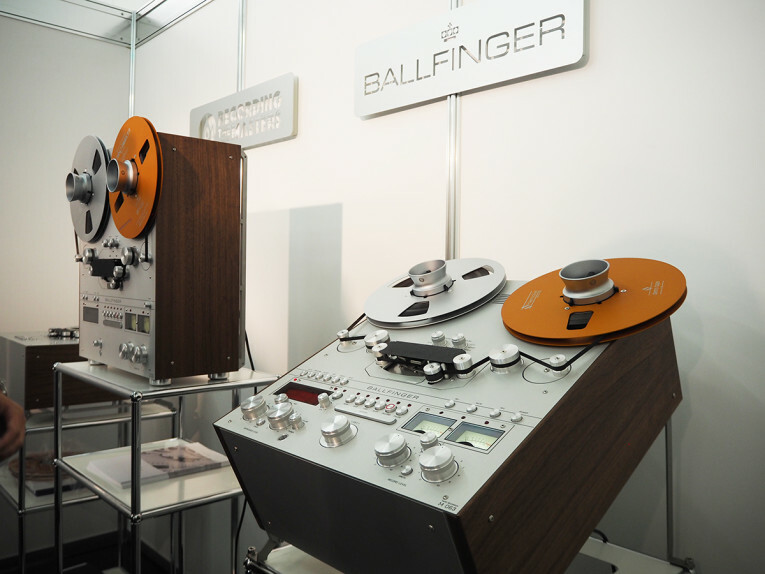 The Ballfinger - Roland Schneider Precision Engineering - are completely new reel-to-reel machines, designed and manufactured in Düsseldorf, Germany. In fact, there are four different models, and they are available now. 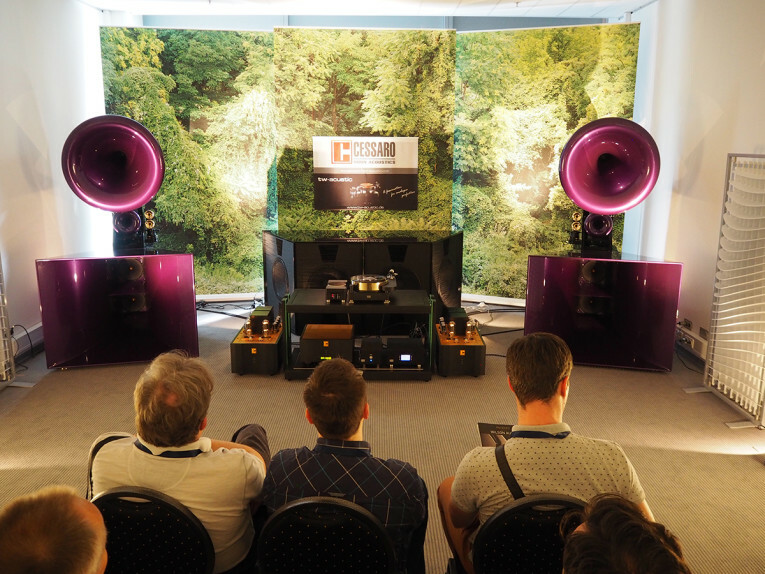 It was impossible to ignore the fact that the large majority of demo rooms in Munich this year were showing turntables, letting excellent speakers down, and obliterating any efforts from many electronic component manufacturers to stand out. Only with the main brands - mostly positioned on the two top floor atriums - could we find high-resolution digital material playing. And the contrast couldn't have been stronger. In this day and age of streaming music, computers, smartphones, and tablets even some major Japanese and European brands chose to showcase turntables. Good thing that I actually found the excellent Cotodama Lyric speaker proudly featured in the Pioneer/Onkio/TEAC booth. A truly refreshing concept that reflects today's music consumers. I know... 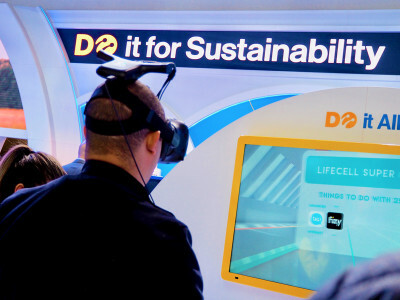 This is High End, and not CES, but I couldn't help noticing how most of the products that the brands were highlighting, appealed to the 50 years or older crowd that already owns the best "classic" gear. And the ones still with money to spend, are probably more in tune with the esoteric craziness of the half million dollar CD players made in Italy and church-organ style speakers that show up at Hifideluxe. 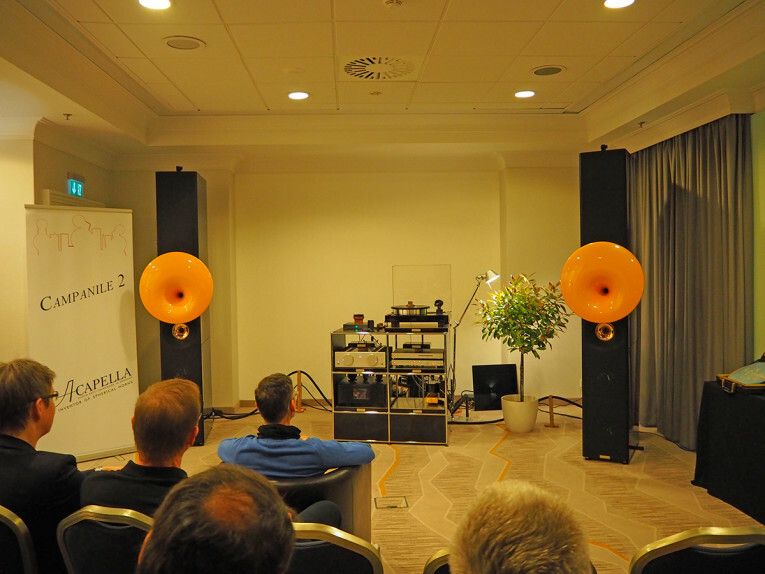 In the early hours of the show, the Manger Audio room was getting ready to demonstrate the new p2 speakers with the famous Manger Sound Transducer, powered by Mola Mola Makua preamp and Kaluga monoblocks. 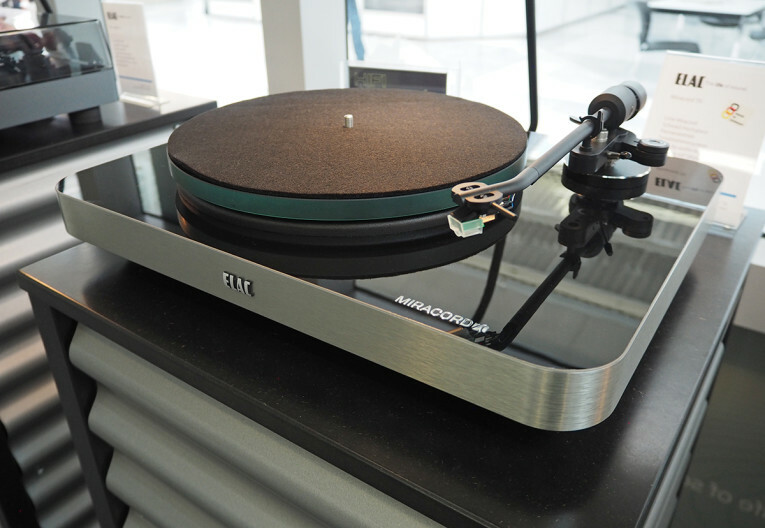 Setting the trend for this year's High End, the source was a German turntable (Scheu Analog). And that's precisely why the upper-class "audiophiles" in Germany seem to be pleased with the German-centric brands such as Nubert (www.nubert.de), Teufel, and ELAC, which have products for all budgets at reasonable prices and sound "decent" and sometimes amazingly good. Even for turntables, those brands offer high-end choices, such as ELAC's excellent Miracord 90 Anniversary ($2,500), and a glance at the expanded Pro-Ject exhibit made clear why the company is becoming a truly lifestyle leader, more than anything. There were excellent electronics on many of the leading and not-so-well-known manufacturers, including many new DACs, amplifiers and even streamers that deserved more attention. 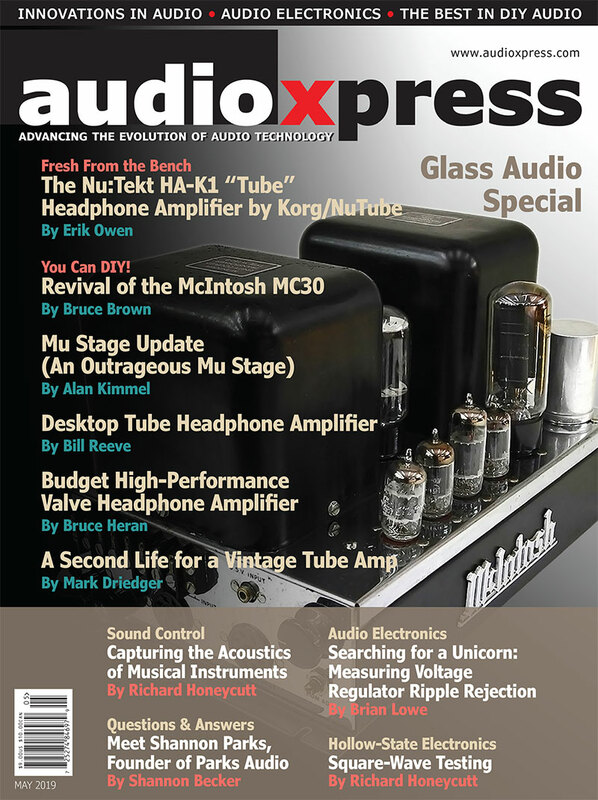 Everywhere I looked at the show, I also saw excellent new headphone amplifiers, tubes, solid state, and hybrids. ELAC's excellent Miracord 90 turntable allows anyone with money to spend to enjoy its vinyl without needing a PhD. No need to go crazy! Part of Pro-Ject S-series components, these tiny things are the Pre Box S2 Digital DAC, using ESS Sabre converters and supporting up to 32-bit/768 kHz PCM and DSD512, as well as hardware MQA unfolding ($349.00), and the Stream Box S2 Ultra ($799.00) a Roon Ready Wi-Fi or Ethernet music streamer. Chord Electronics continues to surprise with cutting-edge combinations, such as the new Hugo TT 2 DAC, which is said to have five times the processing power of the original Hugo TT, a new power supply, six super capacitors instead of batteries, is able to drive any demanding headphones, supports decoding of 768 kHz PCM and DSD 512 files on USB, and even features aptX Bluetooth for wireless streaming. In fact, the Hugo TT 2 DAC, with its balanced XLR and unbalanced RCA outputs and three headphone outputs can be used as a DAC, a headphone amp, or even as a source amplifier connected to speakers. 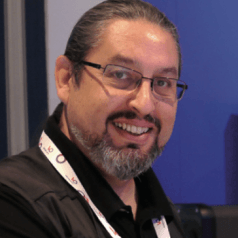 At nearly $4,000, it might be considerable "affordable" for mainstream music enthusiasts, and clearly reflects a different kind of consumer that I didn't see as a visitor at the High End show 2018. Also noteworthy, Mytek Digital (mytekdigital.com) was showing its new Liberty DAC and Headphone Amplifier, a very affordable ($995) general purpose PCM/MQA/DSD USB2 DAC, featuring several digital inputs, digital volume control, and unbalanced as well as balanced audio outputs and a high performance headphone amplifier. On the other extreme, Grimm Audio (www.grimmaudio.com/hifi-products/) was enticing visitors to its room with the new MU1 digital music source, a completely new platform that the Dutch company intends to develop and expand as the ultimate playback system, supporting all sample rates and formats, including a surround playback option with six digital output channels, an integrated FM and DAB receiver, an internal SSD and external USB, and NAS storage support. It was already confirmed to feature Tidal, Qobuz, and Primephonic support as well as Spotify Connect, among many other things in development. It will be available later in 2018. On the amplifier side of things I would highlight Mola-Mola, the Dutch amplification experts, which have now complemented its Makua preamplifier with programmable routing matrix via USB or Bluetooth (optional Phono and DAC boards), and the Kaluga Class D monoblock amplifier using the Ncore module designed by Bruno Putzeys, now adding the Tambaqui DAC as a separate component, featuring a PWM DAC output stage with 32-stage discrete analog FIR, asynchronous upsampling to 3.125 MHz/32 bit, 7th-order noise shaper clearing 80 kHz band, and all types of inputs, including AES/EBU, USB, Ethernet (Roon, DLNA), Bluetooth (A2DP, aptX) and I²S over HDMI. Outputs are balanced and supported formats include PCM up to 384 kHz /32 bits, DoP up to double speed and Native DSD up to quad speed. 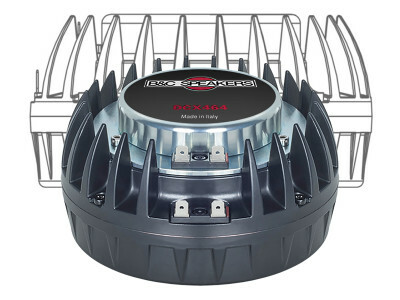 Of course, in contrast with this elegant top quality 2018 solution, there's the new Dan D’Agostino reference power amplifier - The Relentless – a 1500 W monoblock design at 8 ohms, with its 5.5-kW power supply and able to generate 6,000 W into 2 ohms. 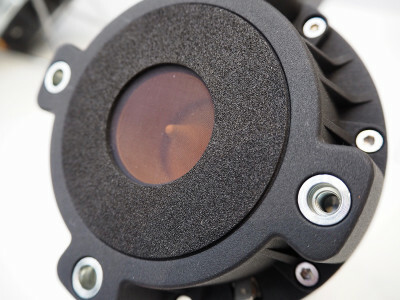 Gain circuits operate in the current domain with an open-loop topology, assuring the Relentless' performance does not fluctuate no matter what the demands. The entire chassis of the Relentless is machined from solid aluminum, with a power meter that measures more than 8 inches in diameter. The whole thing weighs 485 lbs/220 Kg. Anyone who wants a pair in June will have to spend some $350,000 USD. 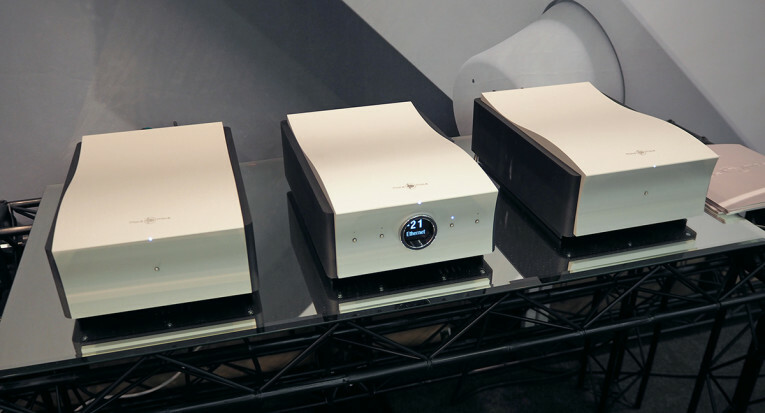 The Mola-Mola Kaluga Class D amplifier monoblocks designed by Bruno Putzeys, with the new Tambaqui DAC in the middle. Technology catches up. 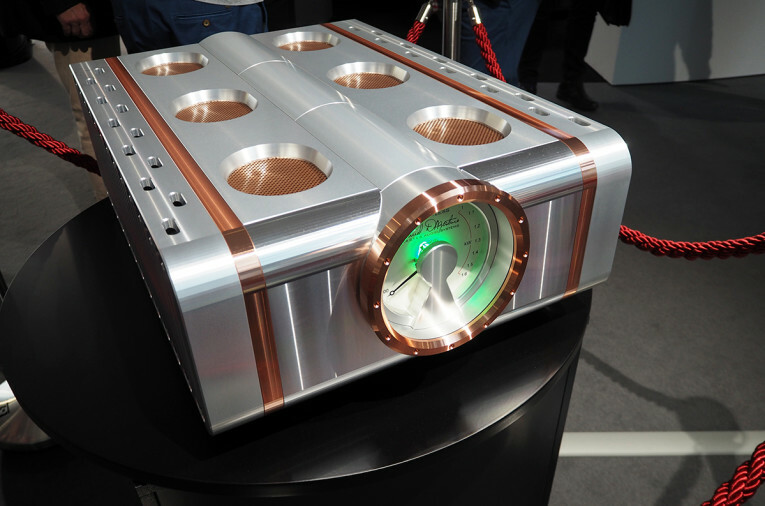 The Dan D’Agostino Audio Systems Relentless Monoblock offers a single XLR balanced input. 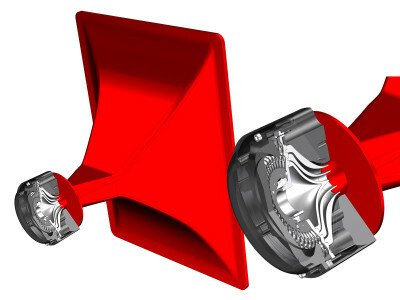 Speaker connections are made using massive binding posts made from gold-plated brass. The new Curante full-range speakers from Bayz Audio were one of the highlights at High End Munich 2018. Powered by Zoltán Bay-designed amplifiers. 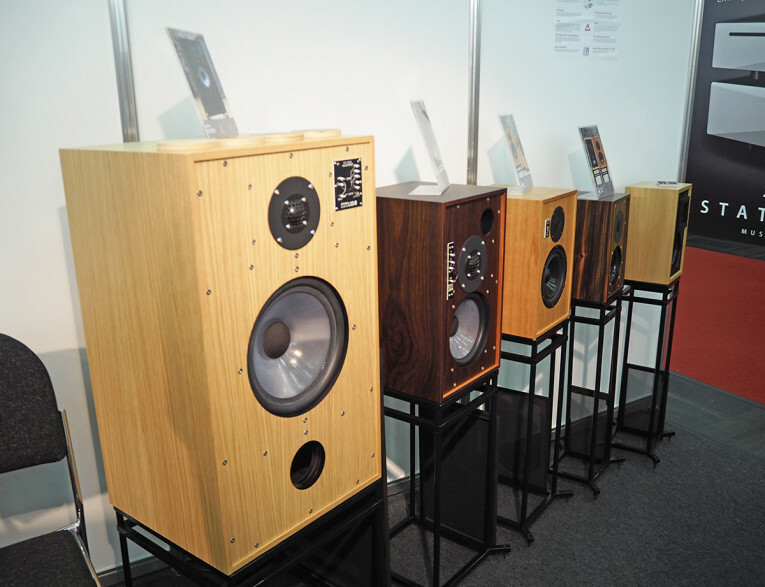 These are the Full-Range Ribbon Loudspeakers from Spanish company Alsyvox. Truly impressive sound covering the full range of frequencies generating one of the most pleasing music-listening experiences I've ever had. 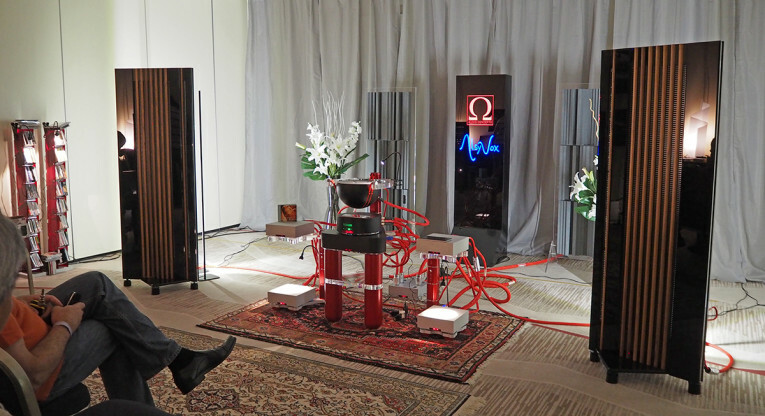 The other "thing" in the middle is The Stream CD Player, designed and handcrafted in Italy by Omega Audio Concepts. The Acapella Campanile MK IV horn towers, made in Germany. These weight 250kg each, and their sound is simply larger than reality. Impressive. 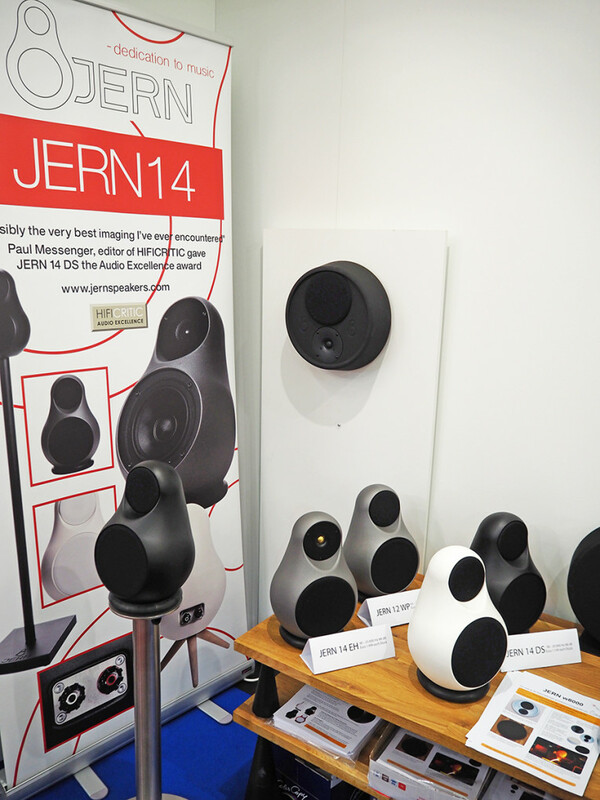 These great looking and compact Jern14 two-way speakers from Denmark caught our attention in Munich. In Danish, Jern means Iron, which refers to the cabinet material. The number 14 is its weight in kilos (approximately 30 lbs). Handcrafted, they look similar, but each speaker is unique. Vivid Audio launched its new more affordable family of carefully designed loudspeakers, Kaya. But the design is also impressive inside, with the three-way and two-way systems using reaction-cancelling drivers and Tapered Tube loading, with folded curved bass absorber horns. 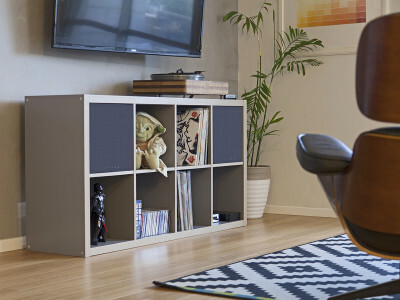 The position of the tweeter and midrange driver also generates a more directional sound. Absolute Luxury Audio. 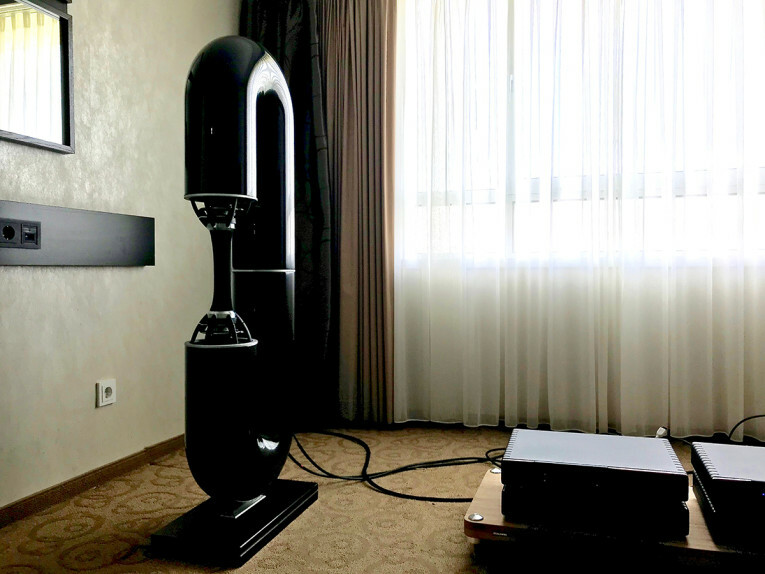 The Kharma room with the new Enigma Veyron EV4-D speakers, paired with Enigma Veyron electronics. A million dollar system, with a fitting turntable... What I really liked were the acoustic panels made out of Bamboo, which Kharma also designs. Not for the faint of heart. 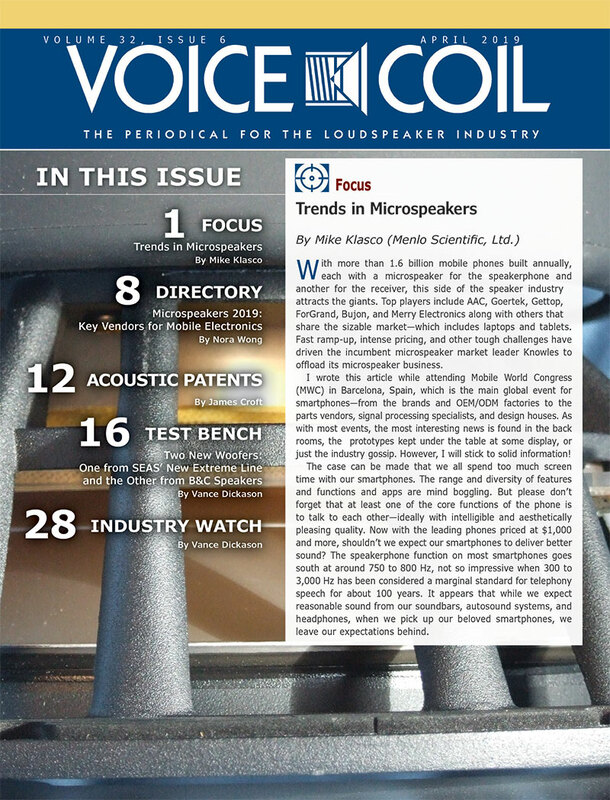 Cessaro Horn Acoustics, bespoke horn speaker masterpieces at $300,000... powered by the company's own tube single-ended amps. All in all, a nice half a million setup for those who can afford it. Plus another few hundred for the turntable, of course! 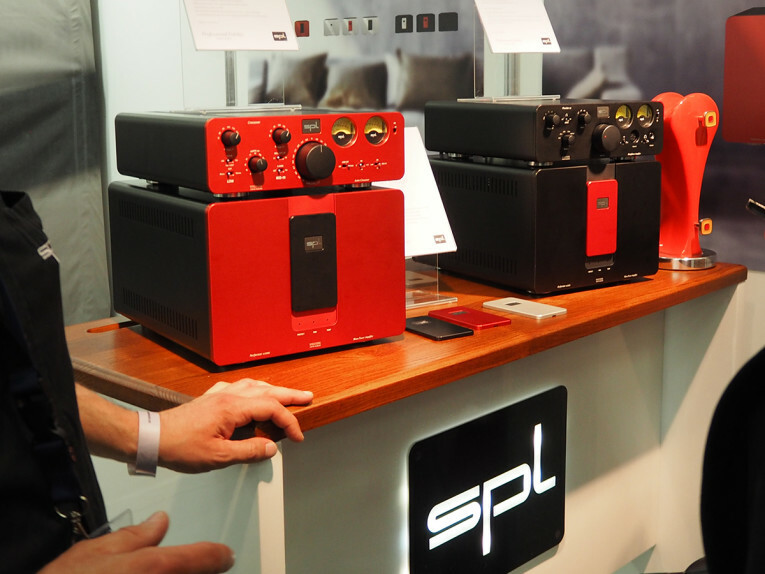 Talking about excellent electronics, German maker Sound Performance Labs (SPL) continues to surprise in both its professional and consumer range, introducing new products faster than the company has time to explain them. 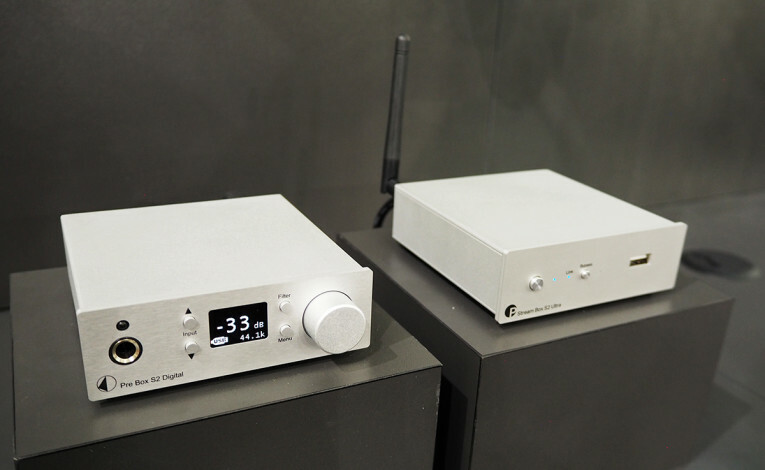 Pictured are the new Phonitor xe Headphone Amplifier and Performer m1000 Mono Power Amplifier, both scheduled to be available in the third quarter 2018. These beauties are the BBC-style monitors from Graham Audio and they are a joy for the ears!